As we head into the last days of July the weather has been good with fewer showers offshore and the fishing in Ft. Lauderdale has been fun with a mixed bag of species providing decent action once again near shore and along the reef line. 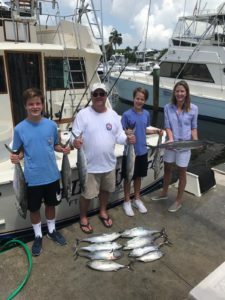 As always fishing is fishing and some days are stronger than others but all charters have produced fish and we have had a load of kids aboard so the focus has been towards keeping them as busy as possible. 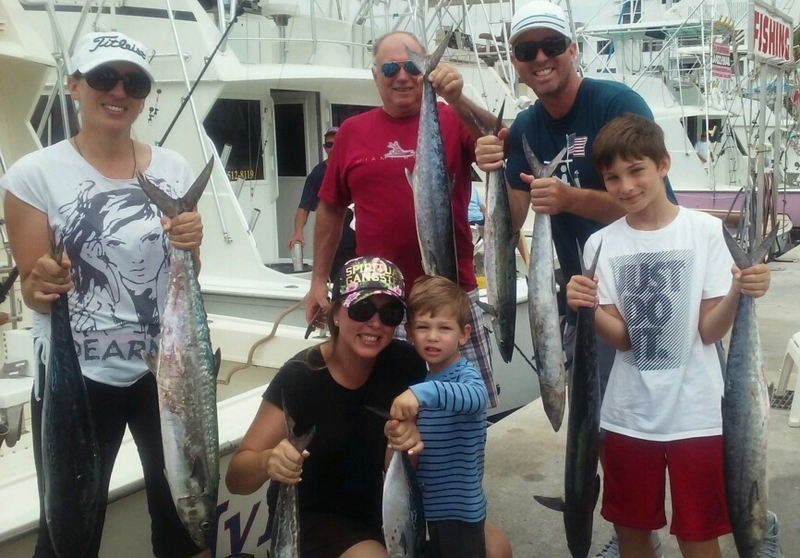 Kingfish, Tuna, some Sharks and Sailfish and others have been in the surface and near surface bait spreads along with some Snappers and good big Amberjacks once again on the bottom on the deeper wrecks. The Florida summer sun is full on as expected and although we have had some welcome days with a little wind there are days that begin with a slighter breeze than others and it gets warm quickly. It isn’t as if we’re inside a microwave as many parts of the country are warmer every day than us here in south Florida, but our infamous humidity can make it very “close”….nice word for sticky. So the A/C units are on all day and an iced water and a quick trip inside the cabin will take the edge off. Plenty of room inside as it seems the kids don’t want to be away from the action regardless of the index, and 1st mates JJ and Garrett only pass through to grab some tackle as they in charge of the cockpit and the running of the lines. We have a little routine here and when it is “close” I ask them what their favorite time of day is, and they reply “Winter”. Summertime offers good fishing action here on most days, so hello south Florida, keep the rod bent and the line tight, and don’t forget your sunglasses and hat. Winter is not just around the corner. 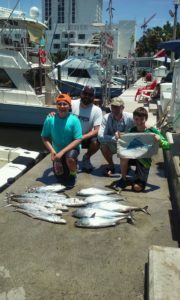 Soon enough but not just yet, and that’s OK, summer break fishing with kids is a good fit. 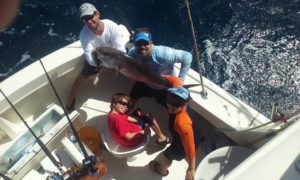 Tight lines from all of us here aboard the Marlin My Darlin, Matt, Tommy, JJ, Garrett and myself.